ZAHAV, Cantors Martin Goldstein and Adam Goldstein, brings a heritage of seven generations of cantors to modern Jewish music. Their father, the late Chazan Jacob Goldstein, was world renowned for his inimitable style, cantorial interpretations and personification of musical excellence. This musical tradition was nurtured and strengthened by the exceptional talents of the mother Harriet and passed on to their sons. 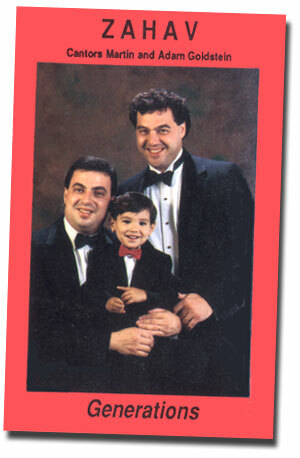 Martin and Adam began their cantorial training at age five under the guidance of the father. This training continued throughout their lives and has culminated into the sound of ZAHAV, a blend of the old and the new. Order ZAHAV - Generations now!